A meme is a mental belief or behavior learned from others. Another definition is a "unit of cultural information." Memetic means of or dealing with memes, just as genetic means of or dealing with genes. Memetics is the study and practical application of the abstraction of memes. The concept of memes moved from academia to mainstream thinking in 1976 with the publication of Richard Dawkins' perennial bestseller, The Selfish Gene. 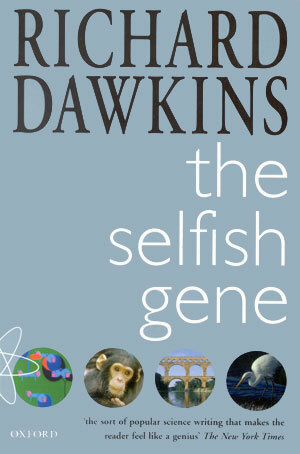 In 1976, in the final chapter of The Selfish Gene, Richard Dawkins dropped a bombshell. In a few quick paragraphs he sketched out what memes are, why they existed, and why they were so crucial to the study of all species whose niche dominance requires a stong culture. The potential of social engineering has not been the same since, because now we can apply all the principles of evolution to learned, memetic behavior, rather than just innate, genetically based behavior. In other words, cultural engineering is now as realistic as any other branch of engineering. The importance of memes lies not in an exact definition, but in the strong parallel between memes and genes, both of which are evolving replicators. This allows the large body of generic knowledge associated with genetic life forms and ecological systems to be applied to the behavior of memetic life forms and social systems. For example, the Competitive Exclusion Principle of ecology applies equally well to genetic and memetic life forms. All memes are learned from others, either directly from other people or indirectly through a transmission medium, such as books or television. All words, unless you made one up yourself, are memes. All learned values, such as “trustworthiness is good,” are memes. Reading, writing, and arithmetic, because we learned them from others, are gigantic sets of interrelated memes. All learned behavior and facts, such as how to run a factory or how to run a country, are memes. Anything we have learned is memetic, rather than genetic. When a meme is learned it has replicated from one mind to another. When a meme fails to replicate, it has lost out in the struggle for survival of the fittest. Whenever a meme replicates, it undergoes a little or a lot of variation, such as the way each new generation pronounces a word differently or interprets what an idea means. Thus memes evolve just as genes do, because they follow the same three steps of the evolutionary algorithm: replication, survival of the fittest, and variation. Memes can form strongly interlocked collections of memes. Basic types of memes are facts, rules, and relationships. Using these building blocks, memetic life forms can be built just as easily as genetic life forms. Biologists have found the abstraction of a genetic life form very productive. Behaviorists are starting to find the abstraction of a memetic life form just as productive, because it exposes the behavioral components of social behavior so clearly. The same pattern is beginning in the field of robotics. There are three types of life forms: genetic, memetic, and robotic. Examples of memetic life forms are cultures, religions, corporations, types of governments, political ideologies, fields of science, and fads. 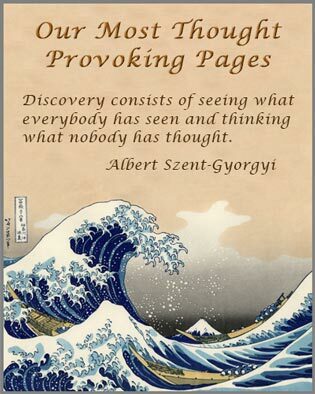 Thus history is not merely a cryptic series of fascinating events caused by people doing this and that. It is much more. The history of civilization is, at the macro level, the history of the evolution of its memes, particularly those that have reached the large life form level. If you understand a society's memes and how and why they evolve the way they do, then you understand what really makes that society tick. And if you understand that, then you can figure out how to engineer that society to evolve the way you want it to, within reasonable bounds. Therefore it is entirely possible, using the science of memetics, to engineer the human system so that it runs sustainably, much like a well engineered machine can run flawlessly, and with proper maintenance and replacement of parts as they wear out, indefinitely. I think that a new kind of replicator has recently emerged on this very planet. It is staring us in the face. It is still in its infancy, still drifting clumsily about in its primeval soup, but already it is achieving evolutionary change at a rate that leaves the old gene panting far behind. The new soup is the soup of human culture. We need a name for the new replicator, a noun that conveys the idea of a unit of cultural transmission, or a unit of imitation. 'Mimeme' comes from a suitable Greek root, but I want a monosyllable that sounds a bit like 'gene'. I hope my classicist friends will forgive me if I abbreviate mimeme to meme. If it is any consolation, it could alternatively be thought of as being related to 'memory', or to the French word même. It should be pronounced to rhyme with 'cream'. 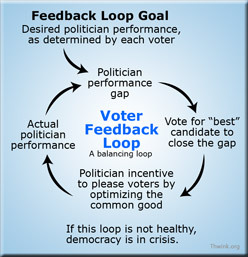 Our analysis of the sustainability problems uses a simulation model called The Dueling Loops of the Political Powerplace. 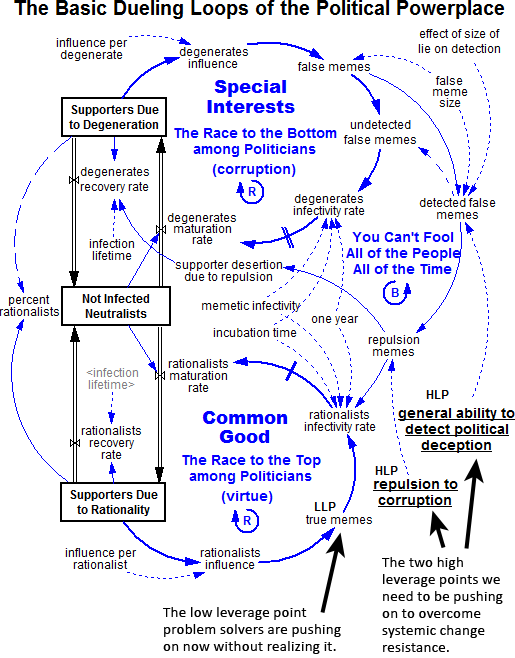 The model uses nodes like memetic infectivity, incubation time, false memes, undetected false memes, repulsion memes, and true memes to model the problem. Without the abstration of a meme, we would have been unable to model the problem as we did. The results would have been a weaker model, and probably the diagnosis (the root causes) would have been flawed. You can see the nodes mentioned above in this diagram.